Nick Spencer is one of my favorite writers; when I see his name on a comic, I am pretty much guaranteed to pick it up, no questions asked. I really had no idea what this one was about. I remembered seeing the solicit months ago and adding it to my pull list. 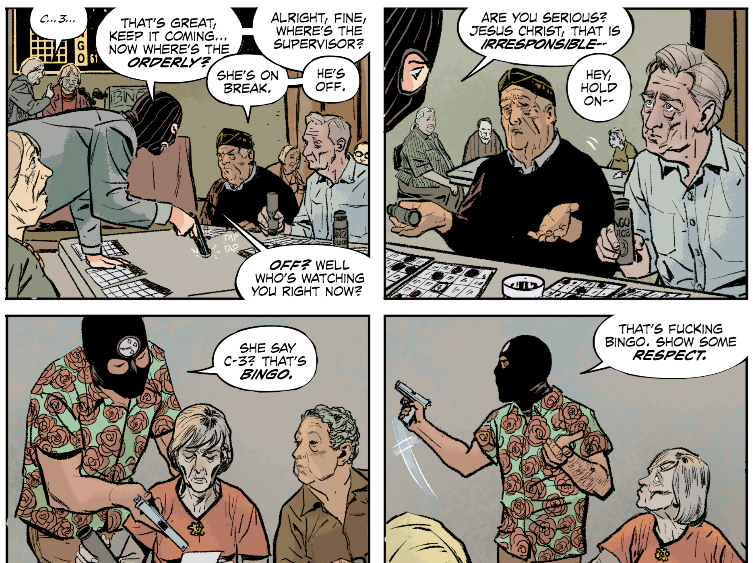 I just knew it was some kind of crime comic by the Superior Foes of Spider-Man team, and that was enough for me. THE FIX starts with a criminal telling us how difficult it is to be a criminal these days. The internet has made most forms of criminal activity obsolete. So this criminal and his partner are looking to rob a retirement home. There is an old gangster there who is supposedly on his death bed and has a lot of money hidden in his room. Easy score, right? Well, no, because this gangster still has a shotgun under his bed and a bad temper to match. They manage to get away with a small haul. We later find out that the two are actually cops. When the lead character was a kid, he always found himself admiring criminals. One day, he happened to be at a bank during a robbery and saw a criminal get his head blown off by a cop. The cop ends up dating the kid's mother, and he gets to see firsthand that cops are just as corrupt as the criminals they are chasing. So he becomes a cop with the intent of using that to help him with his criminal activities. The two criminals have a huge gambling debt to a local crime boss...who also happens to be a gourmet chef and a stay-at-home dad, though he has no problem threatening to carve your taint out. 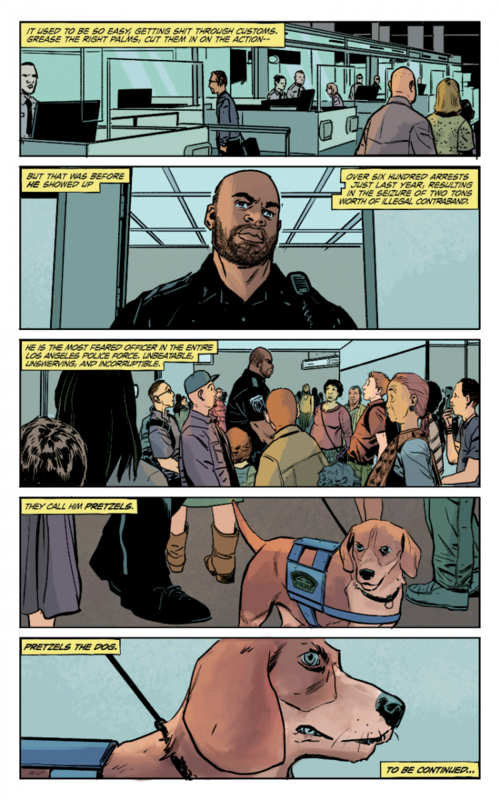 To clear their debts, the crime boss tells them that they are going to help sneak something through Los Angeles airport for him...which will put them at risk from the airport's veteran crime stopper, Pretzels the Dog. 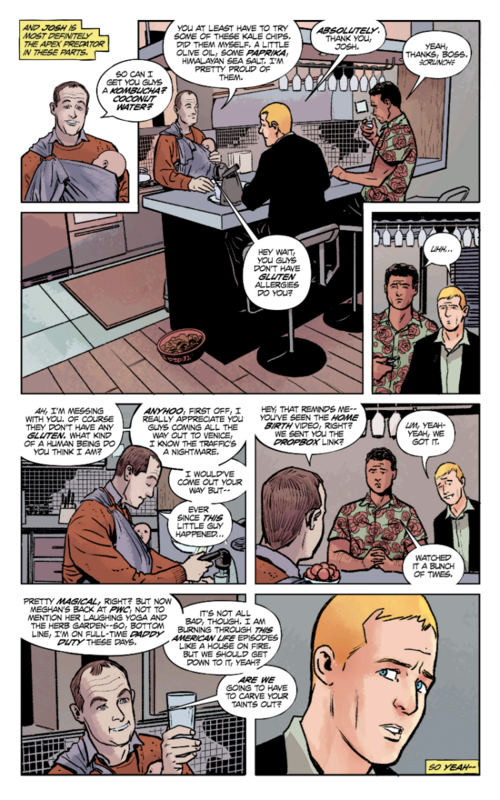 Between Superior Foes and Ant-Man, it's clear that Spencer loves telling ridiculous criminal stories. THE FIX is very much in the same vein, except with all gloves taken off. At Image, Spencer is allowed to be as big, ridiculous, and foul as he wants. The characters are all really well developed, even if most of them seem like real terrible people. I don't mean flawed, I mean that you continue to shake your head with disgust at some of the things they do and say. As is typical of Spencer, this book is very funny. Most writers seem to have a tough time balancing deep storytelling and characterization with humor, but that is very much in Spencer's wheelhouse. Granted, most of the time you are laughing AT how dumb and ridiculous his characters are acting, but it still works so well. I also loved that this book reteamed Spencer with Steve Lieber from Superior Foes. His air is the perfect fit for these ridiculous crime stories. It's bright and colorful, allowing the reader to get a strong visual of everything Spencer is trying to show you. I also thought that this book was a terrific value. You get almost 40 pages of story here for $3.99. That is basically the base price of any Marvel book, and if they went up to 40 pages, they would usually charge you a buck more, and those extra pages would be padded with backup stories that no one cares about. I did have one small complaint about this comic. Has anyone who worked on this comic actually player BINGO before? There is a great scene in the retirement home where we see someone win a BINGO game, and the criminal insists that everyone respect the sanctity of BINGO rules. But the winning ball was C-3. THERE ARE NO C BALLS IN BINGO. Petty complaint? Yes! But I try to be fair and balanced, and that was the only thing I could possibly complain about here. Is it worth your $3.99? Yes! Last week had a lot of real good comics, and THE FIX might have been the best of the bunch. Spencer never lets me down, and Image seems to have another success on their hands with this one.